John Murray PP draws attention to four features of Leo’s pontificate: he was a layman when chosen for the office; he was able to keep the invaders from the north – the Huns and the Vandals – at bay; he was a focus for unity in the Church; and he gave powerful expression to the dignity of all Christians who believe in the incarnation of Jesus, truly God and truly human. ‘Santo subito’ and ‘John Paul the Great’ were just two of the many banners which covered St. Peter’s Square in those heady days of April 2005 when Pope John Paul had died and millions of people from all over the world made their way to Rome to honour and thank him for his papacy. The prayers of God’s people and the Congregation of the Saints will decide in due course if the first title (‘make him a saint soon’) will be realized. History will decide the latter accolade. Surprisingly only two Popes have received the title ‘Great’ in the two-thousand-year history that is the papacy. One was Gregory who lived at the end of the sixth century and the other was Leo who was Pope between 440 and 461. He is the subject of my thoughts this month. Leo is rightly called ‘Great’ for all manner of things that he did and for the way he led the Church at a time of political turmoil. However I want to remember him this month – as we approach the holy season of Christmas – mainly for something he wrote, but more about that later. Worthy lay papal candidate ! Leo was born in Tuscany, central Italy, about the year 400 but the family came to live in Rome when he was still young. Strangely enough, Leo was not even a priest or a bishop when he was chosen to lead the Church of Rome. His position was more that of a civil servant and he was away on a civil mission in France to bring about peace between two of Rome’s military leaders when the call to return came. The clergy and the people of the city could think of no more worthy candidate for the vacant see after the death of Pope Sixtus III. By the clarity of his vision for the Church and by the force of his administration he was to do much to fashion the papacy as we know it. It is said that were it not for the Popes, Rome today would very likely be a mass of ruins like Babylon or Carthage or other ancient cities. Leo is especially remembered for saving the city from the invasions of the Northern tribes. The power of the empire was at a low ebb at that time and the prospect of riches and fame was attractive to the invaders from northern Europe. Attila the Hun came in 452. 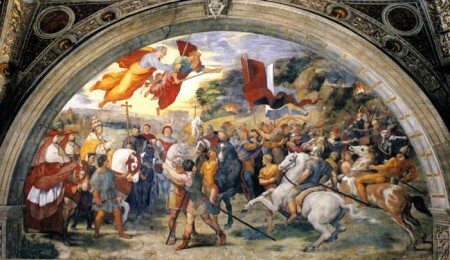 A painting by Raphael shows the invader facing Leo, but behind him he sees Peter and Paul supporting the Pope’s demands. In any event, Attila backed down. However when Genseric the Vandal came a few years later, the Emperor was dead and no military leader was defending the city. Again Leo met the invader and persuaded him not to destroy the city. Genseric and his men pillaged for two weeks but no one was killed and much of the art and architecture was spared. This love for the Church even extended on occasion to the correction of his fellow bishops. 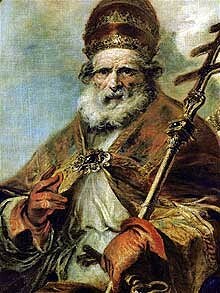 One such was St. Hilary, bishop of Arles. Hilary, a holy and saintly man, had deposed Celidonius, bishop of Besancon. The latter had come to Rome to appeal and Hilary quickly followed to make his case. At the same time, others had protested that Hilary had consecrated another bishop while the incumbent was sick but still in office. In a letter to the bishops of Gaul (France) Leo declared Hilary deposed from metropolitan jurisdiction and limited to his own bishopric: ‘Anyone who dares to secede from Peter’s solid rock may understand that he has no part or lot in the divine mystery.’ Hilary, saint that he was, submitted and peace was restored to the church of that region. Many of Leo’s sermons have come down to us today. Written in Latin they are renowned for their clarity of thought and ability to reach the common man. However it is his Christmas sermons (eight in all) which above all merit his unique role in Christology. 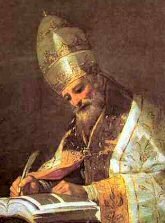 In one of Leo’s 173 letters, dubbed ‘The Tome’, he wrote to St. Flavian, bishop of Constantinople, in reference to the views of an abbot, Eutyches, which had been condemned earlier at a synod held in the great Eastern city. ‘The Tome’ is dated 13 June 449 and later it was read to more than 500 bishops at the great Council of Chalcedon in 452. St. Leo’s words describe the greatest moment in human history, that moment when God the Son took on our human nature: ‘Thus the Son of God enters this lowly world, He comes down from the throne of heaven, yet does not separate himself from the Father’s glory. He is born in a new condition, by a new birth. Beyond our grasp, He chose to come within our grasp.